We have written on risk associated with large ring motors in gearless mill drives previously [1, 2, 3]. In , we observed that ABB and Polysius were far too confident in 2001 when they claimed that 42 and 44 ft diameter mills and ring motors posed only manageable risks and that a 44 ft mill and GMD design was ready and waiting for a purchaser . The multiple failures of ABB drives after 2001 proved this point. A more recent contribution to the topic of risk associated with large mill drives is presented in the “Insurability of Mill Drives” . The paper’s authorship is a surprising combination of an insurer’s risk engineering division and a GMD supplier (Zurich Insurance Services and ABB). Does the inclusion of an insurer in the paper imply an endorsement of the ABB design as being an acceptable or low risk? Does it mean that Siemens must make changes to their winding design and eliminate their tachometers so their motors become “less risky” since these issues are highlighted in the paper as being disadvantageous to ring motor design? Let us hope not because the original Collahuasi and Antamina SAG mill stators most likely would still be operating had they been wound with the type of VPI parallel windings used by Siemens. In this post, we review the new 24 h repair criterion proposed in  and how it applies to winding design. The key items in an engineering risk assessment presented in the last section of  are also be reviewed. A new criterion proposed in  is that repairs in a GMD should only take 24 hours to complete. These may be temporary repairs if a full repair requires an extended shut-down. It would be dangerous for the mining industry if owners and insurers were to weight this criterion very heavily in evaluating the relative risk between motor designs. Consider the specific example of winding design is used in the paper. The paper indicates that the bridging of a winding can take a lot of time but this can be avoided if the winding is “designed correctly from the beginning”. It is true that the ABB bar windings can be bridged more easily than the Siemens parallel windings. However, the ABB windings result loads that are approximately 30% greater than those generated by Siemens windings due to the lack of electrical damping. This is critical as the size and rated power of ring motors increase. In , we showed that the Collahuasi failure occurred because the hanger plates were loaded more heavily than hanger plates in smaller motors. Had the Collahuasi motor been wound with Siemens-type parallel windings, the loads in the hanger plates could have been reduced by 30%. This reduction alone would have most likely prevented the hanger plate failures at Collahuasi, as the load per hanger plate would have been less than the hanger plate loads in the Antamina and Telfer motors. Furthermore, ABB insulated the stator windings of the Collahuasi and Antamina motors with Nomex paper. 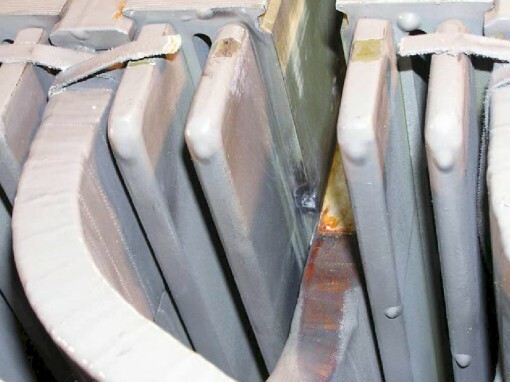 Had they chosen VPI insulation as used by Siemens, the frequency of partial discharges that burnt out sections of the electrical cores would have been reduced and shorting of the windings at Antamina due to lamination movement would have been avoided due the the hardness of the VPI windings. Therefore, the Collahuasi and Antamina SAG mill stators would not have required replacement so early in their operational lives had ABB had used parallel windings with VPI insulation. So, is a 24 h repair cycle for relatively low frequency failures of a VPI windings more important than other design features such as lower loads in the stators and the foundations? We don’t believe so. This “quickly repairable concept” should not rank highly in any engineering assessment of ring motors. compromises made during design to fit a plant – the motors are bespoke pieces of equipment, not off-the-shelf items. In fact, given that the paper was written with the benefit of hind-sight, it is surprising that there is nothing in the engineering assessment list that would assist an insurer in detecting the risks associated with the major failures that have occurred in the past 20 years. We have said in a previous post  that GMDs, ring motors and mills are designed in an evolutionary manner. What we see as dangerous is the potential for external influences such as owners’ or insurers’ perception of risk of a fundamental aspect of a design to dramatically influence the direction of this evolution. External influences that result in accelerated conceptual changes to GMD designs have proven to be expensive in the past . Altering the winding design in a motor from parallel to series windings or vice versa would constitute a such conceptual change. VPI insulated windings do not have a high failure frequency and therefore there is no reason to weight the time taken to bridge a winding very highly in a risk assessment. The key items of a GMD installations listed in  for consideration in a risk assessment do not consider the lessons learnt from the failures of the past 20 years. Meimaris, C., Price, B. F., Manchanda, S., 2006. How big is big? – Revisited. SAG 2006 Conference, Vancouver, Canada. Meimaris, C., Price, B. F., Manchanda, S., 2006. Large gearless driven mill systems – Responsibilities and capabilities. SAG 2006 Conference, Vancouver, Canada.